India surprisingly underperforms in services exports. It needs to rethink its approach. On average, world trade in commercial services has grown faster than trade in merchandize (8 percent versus 7 percent per annum) over the last 30 years (1980-2011) according to the World Trade Report, 2013. In U.S. dollar terms, world exports of commercial services could grow by 2 percent to $4.3 trillion in 2012, while exports of merchandize remained stagnant at $18.3 trillion. Given the predominance of the tertiary sector in India’s GDP, it is interesting to examine how India fares in global exports of commercial services. How bright are the prospects for India’s services export? Going forward, does India need to change its policy focus? Can it continue depending so much on IT & ITES and a few developed markets for its export of commercial services? As the table shows, exports of most commercial services including transportation and tourism services showed moderate growth rates, while exports of communication, financial services and royalty & license fees declined in 2012. Computer & information services grew 6 percent in 2012 to $265 billion. Exports of other business services that include engineering services, accounting & legal services, management consulting, advertising and trade related services among others expanded 2 percent, while that of personal, cultural & recreational services rose 3 percent in 2012. The U.S. and Western European countries like the U.K. still remain the largest importers of commercial services. However, BRICS nations – China (19 percent), Russia (16 percent) and Brazil (7 percent) were the fastest growing import markets for commercial services in 2012. China and Hong Kong together account for 8.2 percent of global imports of commercial services, as compared to the U.S. with 9.9 percent. Other rapidly growing import markets include Australia, Japan, South Korea and Nigeria. Unlike manufacturing, exports of services are not as dependent on the quality of basic infrastructure or regulatory regime. In addition, India scores over other countries on the availability of technically qualified workers with knowledge of English. However, the contribution of the tertiary sector to India’s total exports of goods and services is still only 33 percent, even though the sector accounts for roughly 57 percent of GDP. Despite the hype about India’s comparative advantage in services, as compared to China’s 4.4 percent, India’s share in global exports of commercial services stood around 3.4 percent in 2012. India’s services exports have a narrow base (in terms of product offerings and market mix) with IT and ITES alone accounting for 40 percent of the total. Of that, more than 75 percent goes to just three countries — the U.S., the U.K. and Canada. 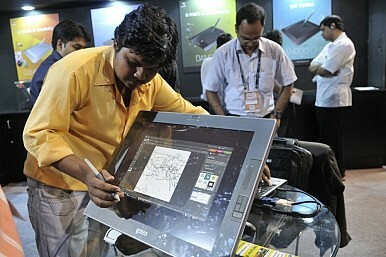 In 2012, India’s share of global export of computer & information services was 18 percent, as compared to 4 percent in other business services, the largest component of the global commercial services pie. Meanwhile, India’s FTAs mostly cover trade in merchandise only. Even where trade in commercial services is covered under its comprehensive trade pacts, in the absence of mutual recognition agreement (MRAs), India’s service suppliers do not benefit from preferential market access. The best examples are the India-Korea and India-Japan trade pacts. The slow progress of the trade in services agreement under the India-ASEAN FTA has not helped. The proposed change in U.S. visa regulations and growing sentiment against outsourcing will constrain India’s exports of IT & ITES to the U.S. India will thus need to push exports of business services in addition to traditional services like travel & tourism, where there is immense untapped potential. In 2012, India’s share of global exports of travel & tourism stood at just 1.6 percent ($18 billion), compared to China’s 9.2 percent ($102 billion). Given the growing share of emerging nations in imports of commercial services, India can expect more growth in exports from countries like China, Russia, Brazil and Nigeria. China, including Hong Kong, as well as Russia, Brazil, Australia and Japan imported $700 billion worth of services in 2012. Of this, other business services alone was worth $146 billion, while computer & information services stood at close to $20 billion. The rising cost of skilled employees in a bleaker external environment can adversely affect India’s services exports, as does increased competition from new players like China or Philippines. A strengthening rupee could also dampen prospects. In the short–run, India needs to expedite its MRAs to push services exports through preferential routes. The long-term solution lies in ensuring an adequate supply of skilled workers, in addition to broadening its offerings in services and reaching out to key emerging markets. Moving up the value chain is the way to go if India does not want to compete on labor costs alone. That calls for intensifying the R&D effort. A serious flaw in India’s negotiating strategy is placing too much emphasis on getting market access for Mode 1 (covering BPO/KPO) and Mode 4 (covering movement of professionals), which are politically difficult to push, especially in the current macroeconomic environment when outsourcing is increasingly being seen as transferring jobs abroad. In addition, given the ever-growing trans-boundary presence of Indian businesses, it is time India developed trade interests in Mode 3 (commercial presence in the country of service receivers). India enjoys a legacy of delivering IT & ITES offshore, a legacy that could be leveraged for the export of non-IT business services. Ritesh Kumar Singh is a corporate economic advisor. Anshul Pachouri works with a consulting firm. The views here are their own. India’s Next Free Trade Partner: Peru? India and Peru look to cement a rapidly growing trade relationship with a free trade agreement.